ENTERING the 2013 season, the wraps on young Adelaide midfielder Brad Crouch couldn't have been much higher. 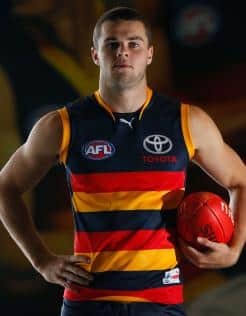 With a year in the system after being taken behind Gold Coast prodigy Jaeger O'Meara in the 2011 Greater Western Sydney mini-draft, many believed he was ready to make an immediate impact. But while O'Meara made an impressive debut in round one, Crouch had to return to West Adelaide in the SANFL, where he honed his craft to much acclaim in 2012. The feedback from the coaches was that like many draftees he needed to improve the defensive side of game. "I was pretty disappointed when I didn't get selected for round one," Crouch told AFL.com.au. "But I've spoken a lot with Brenton Sanderson and the coaching staff about how to improve the defensive side of my game. "It's something I'm really keen to get better at." Although that much-anticipated debut came in round two, a hamstring injury and indifferent form stunted Crouch's progress until Saturday's breakout performance in the win over O'Meara's Suns. Not only did the 19-year-old rack up a career-high 31 possessions, he was the leading tackler on the ground with six. It's a statistic that would have pleased his coaches in a performance that earned him the round 14 NAB AFL Rising Star nomination. "I was happy with my defensive game more so than getting a bit of the ball; it was the best game I've played at AFL level," he said. "It was good playing against Jaeger and I reckon he'll be the one to take out the Rising Star this year, but I'm proud to get this week's nomination." Crouch's development has Sanderson excited. "Brad has been very impressive in his first AFL season. He's played the majority of his football in the midfield, which is extremely demanding for a player of his age and experience," Sanderson said. "I'm confident he will be a very special player for the Adelaide Football Club for many years to come." A product of the Beaufort Junior Football Club and North Ballarat in the TAC Cup, Crouch has settled into life in the City of Churches. He keeps busy away from the club with a coaching course and is also involved with a charity helping the homeless. But his mind never drifts too far away from footy. "I watch a lot of footy and sometimes I get told I watch too much, but I've always been a massive footy-head.